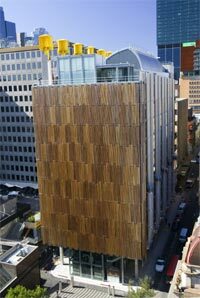 The Green Building Council of Australia has awarded the building six Green Stars which represents world leadership in office building design. The Green Star rating system separately evaluates the environmental design and performance of Australian buildings based on a number of criteria, including energy and water efficiency, quality of indoor environments and resource conservation. The Green Building Council of Australia has awarded the building six Green Stars which represents world leadership in office building design. The Green Star rating system separately evaluates the environmental design and performance of Australian buildings based on a number of criteria, including energy and water efficiency, quality of indoor environments and resource conservation. + The building design cuts C02 emissions by 87%, electricity usage by 82%, gas usage by 87% and water usage by 72%. * The value of building as a guiding light in sustainable building. 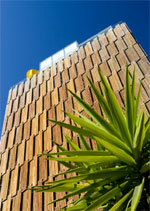 * The value of building as a guiding light in sustainable building. This page has been accessed 64,889 times.